Canmore is a lovely little town located in southwest Alberta near Calgary. Canmore is just a 10 minute drive outside of the Banff Park Gates, 20 minutes to the Town of Banff, and about an hour from its nearest big city Calgary or four hours from Edmonton. If you’re travelling or considering ‘Rocky Mountain’ experiences in that area, most visitors tend to drive right on through to Banff or Lake Louise. But there’s so much to do in Canmore/Kananaskis region before you even get to spots like Banff or Lake Louise, it’s increasingly becoming a mountain destination in its own right. 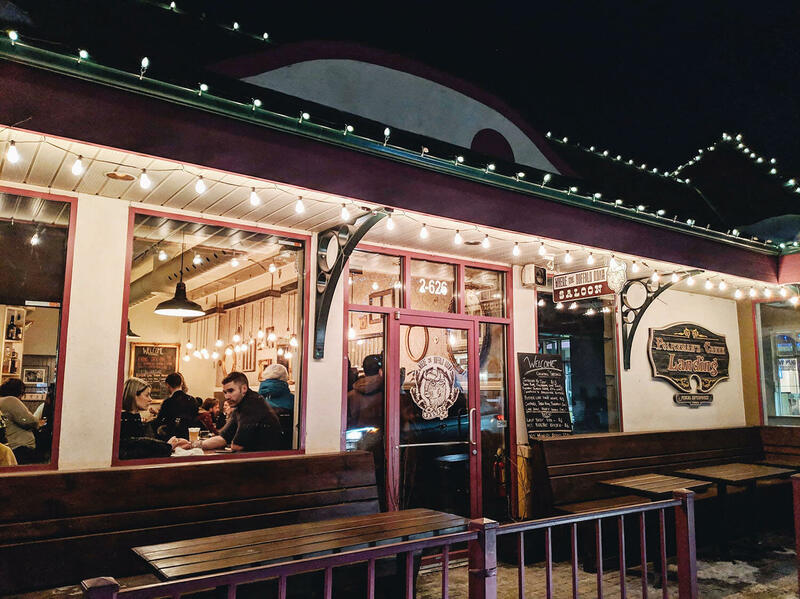 I’ve been making lots of visits down to Canmore this year and have been completely blown away with the variety and quality of restaurants and number of things there is to do in the area. 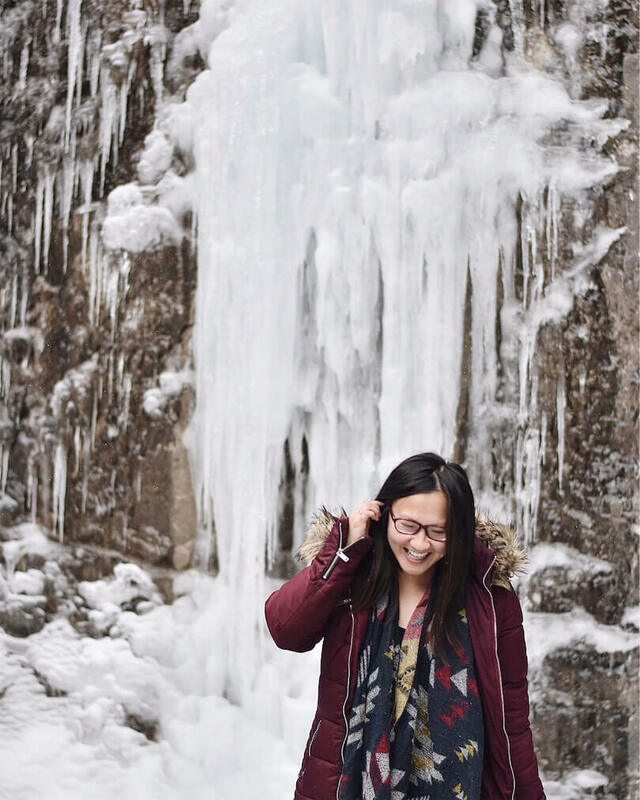 My friend Lea recently blogged a few great ideas for exploration in Canmore so be sure to check out her suggestions, but I’m happy to highlight some of my experiences too! 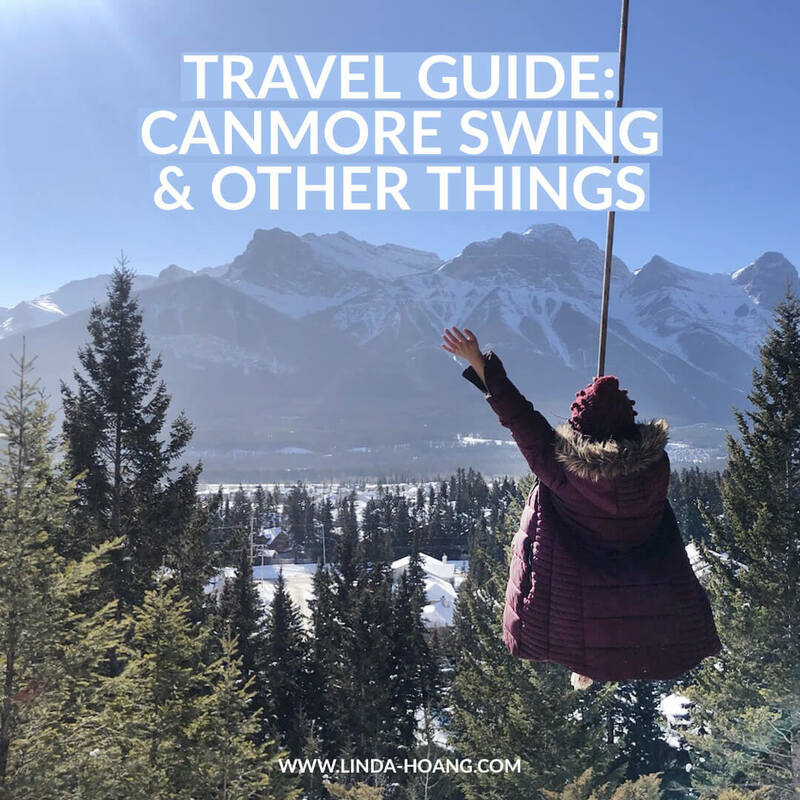 Pin + share my Travel Guide: Canmore Swing & Other Things (Explore Alberta). The Canmore Swing is a hidden swing located near a hiking trail in Canmore. Popping up every so often on my Instagram feed were the coolest photos of people swinging over what looked like a mountain cliff, with more mountains and forest in the background. 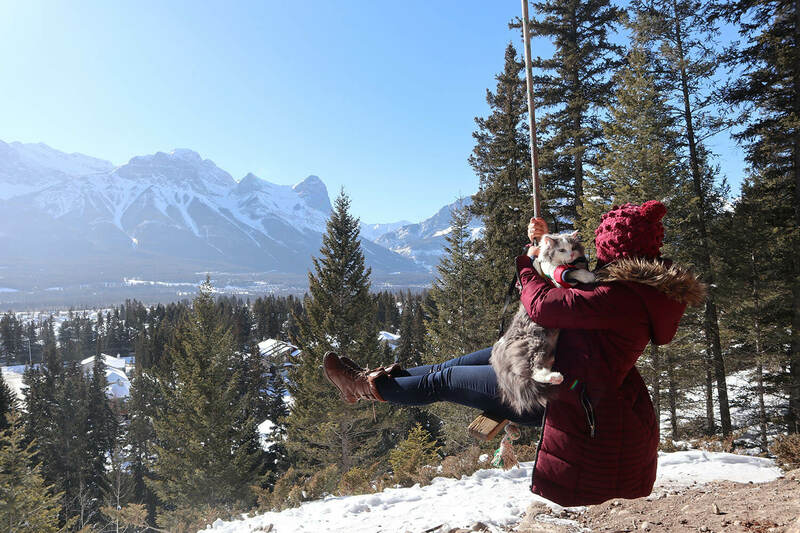 Thanks to my friends at @flannelfoxes and photographer @mollyyli, I was pointed to this blog post which explains how easy it is to get to the famous Canmore, Alberta swing. What is the Canmore Swing? 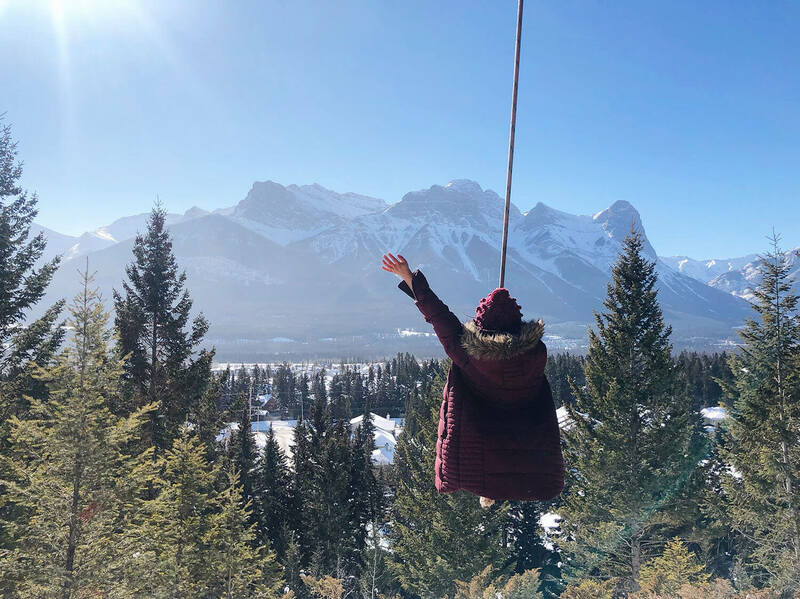 The Canmore Swing will give you gorgeous views of the Bow Valley’s popular mountain peaks including Ha Ling, Miner’s, Mount Lawrence Grassi, and Ship’s Prow. No one really knows who installed a rope swing to a giant tree near the Cougar Canyon/Creek area of Canmore. Internet searches don’t yield anything in terms of history, though it does make appearances in a few different Canmore Travel blogs. The swing faces stunning mountain peaks Ha Ling Peak, Miner’s Peak, Mount Lawrence Grassi and Ship’s Prow. For years since its mysterious installation, people have been hopping on for a fun swing and photo op (or epic slow-mo video). How do you get to the Canmore Swing? The Canmore Swing is located on the other side of the highway—not the town side. If you follow Google Map directions to Ridge Road, you’ll see a playground on your left side and residential street parking on the right. Next to the playground is a path up to the swing. (Not just the swing though, it’s a popular hiking area as well). Please note: the area is a residential street so be respectful of street signs and any parking enforcement. It’s definitely easier to hike up the hill during the spring/summer. I was slipping a fair bit on my way up during our winter trip, but it’s still definitely doable in snow and ice too (just wear shoes with good traction). At the top of the hill, you’ll walk right for a few minutes to hit the swing! It’s a very quick approach and easy hike. But depending on when you go, there may or may not be a line-up if people waiting to get their turn on the swing. There’s lots of different photo angles you can try with the Canmore Swing! Try taking photos from both left and right perspectives from the swing, as well as right behind it! Good variety of angles will ensure you get the perfect photo. If you time your visit for sunrise or sunset, you may get a more epic photo! I think it also looks coolest if you try to exclude the ground, as it makes you look much higher up, and like there’s just forest below you. Try different poses too like looking towards the mountains, back at your photographer, completely lying back on the swing (the rope is strong! It’ll hold you), or with an adventure cat in your arms (lol) for some photo variety. Wearing a cute flowing dress (easier to do in the summertime lol) will result in some pretty nice photos, along with a hat! And be sure to check out the #CanmoreSwing Instagram hashtag for some more photo inspiration! It was pretty cold when we went to the swing and there as a mom/daughter waiting to try it too, so I actually wish I had gotten a few other angles… but I’ll certainly be back to get more shots!! 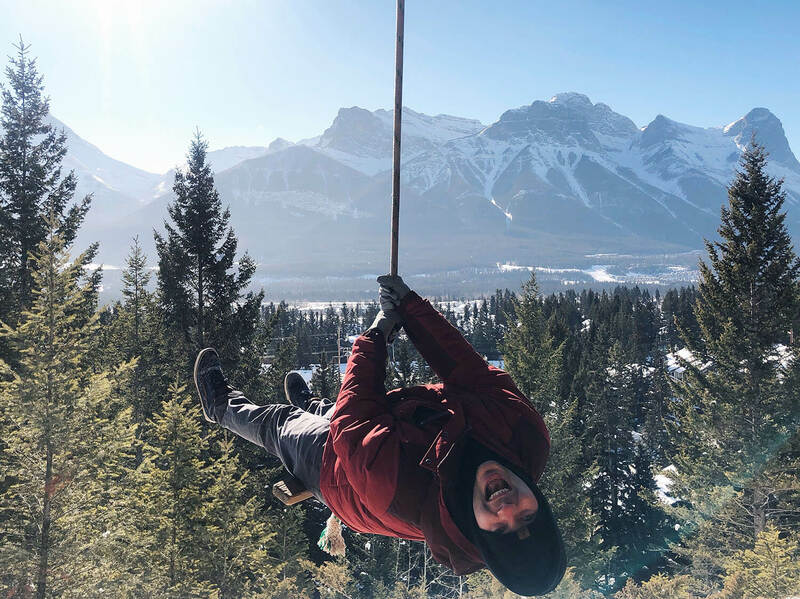 Is the Canmore Swing Really High Off the Ground? The Canmore Swing is actually not that high off the ground at all! It’s all about the angles! The Canmore Swing really isn’t too high off the ground and even on a good swing you’ve still got some decent ground below you (it’s just all in the angles of your photographs!) So while it may look quite high up and sometimes scary in some images you might see (especially on Instagram!) it’s actually quite safe (but I cannot be held liable if you get injured on the swing lol). So that’s my little spiel on the Canmore Swing. I can’t wait to return during the summer and get some more fun photos! 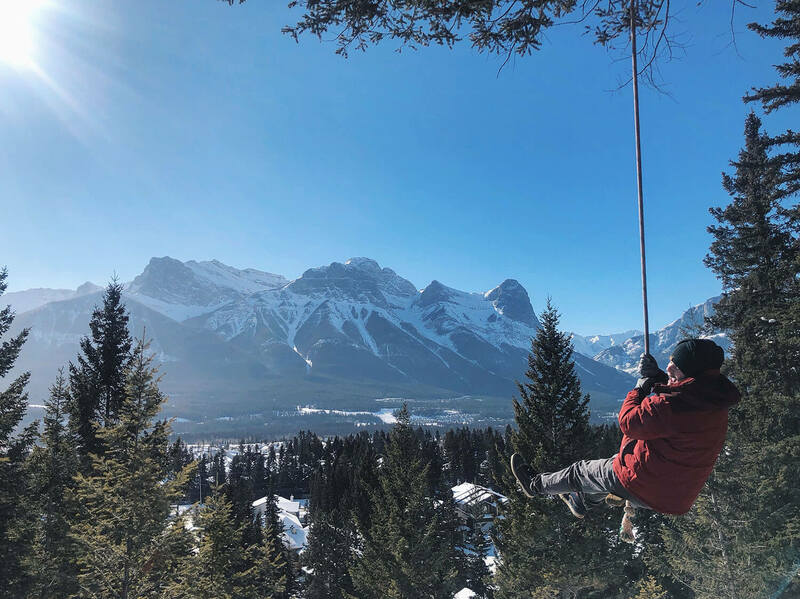 I love that someone just decided to tie a swing rope to a tree overlooking the gorgeous Bow Valley and didn’t advertise it—that it just naturally gained traction after a few people discovered it and decided to post about it online. That’s really neat… and I wish there were more fun swings and hidden things like that across Alberta. Now if the swing isn’t all you’re planning to do in the area (lol) below are some more travel recommendations! Adventuring in the meow-tains with Gary the Cat (@greatgramsofgary on Instagram). 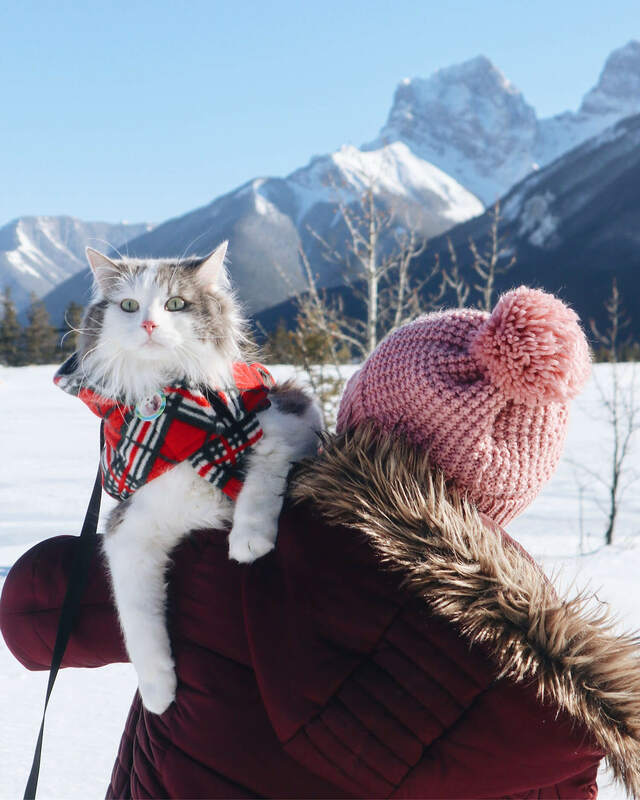 One of the reasons for my latest visit to Canmore was actually to take some outdoor photos with my friends’ James and Ashleigh’s Instagram famous cat Gary. Gary, who you can find on Instagram at @greatgramsofgary or Reddit at r/gary_the_cat, is no stranger to meowntains and furrests and makes a perfect meowdel for some meowntain photos! Of course, taking your own mountain photos sans Gary (or any adventure cat) will be just fine too lol. We took some photos at the Canmore Swing as well as near the Nordic Centre, on the road to Spray Lakes, looking out at the Three Sisters Mountain Range. There’s tons of hiking in Canmore (they call it a hiker’s ‘nirvana’). So you can find lots of routes that fit your experience level and what type of photo ops you may be looking for. The frozen waterfall at Grotto Canyon is gorgeous! If you’re looking for some frozen waterfalls, Grotto Canyon is a family-friendly, beginner hike that offers some great waterfall photo ops which we experienced firsthand. There is also a hoodoos and cave area with old pictographs carved on the rocks. Alberta is home to a lot of bubble lakes! Alberta is home to the famous Bubble Lake—Abraham Lake—near Nordegg Alberta, but this isn’t the only bubble lake in the province. Near Canmore, you’ll be able to find bubbles at Spray Lakes, Two Jack or Lake Minnewaka (although the latter two are closer to Banff, not Canmore). Sometimes visiting these lakes for bubbles specifically can be hit or miss, depending on how much snow has fallen, how cold and how windy it is. 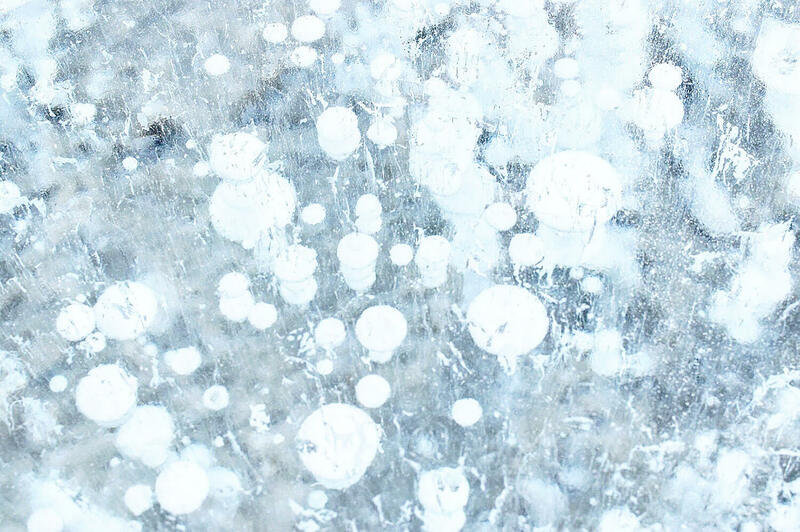 We had no bubble luck during our most recent visit to Spray Lakes but another friend shared some great bubble photos from her visit to Lake Minnewaka so it’s definitely possible to see bubbles at these lakes (it’s just maybe more guaranteed at Abraham Lake). The nice thing about visiting one of these lakes though is their close proximity to town (whereas a trip to Abraham Lake is a bit of a drive with not a whole lot of services nearby). The most delicious waffles at Table Food + Drink in Canmore. There are so many great restaurants in the town! There are so many places to eat and drink in and around the tiny town of Canmore, I was honestly so pleasantly surprised when I kept discovering restaurant after restaurant. Earlier this year (2019) I had been trying several restaurants as part of a freelance gig writing restaurant features for the Rocky Mountain Outlook newspaper. And I’ve also tried a few places just for fun too, so I feel like I’ve got a pretty good handle on good eats in Canmore—and yet, there’s still so many spots I need to come back and try! 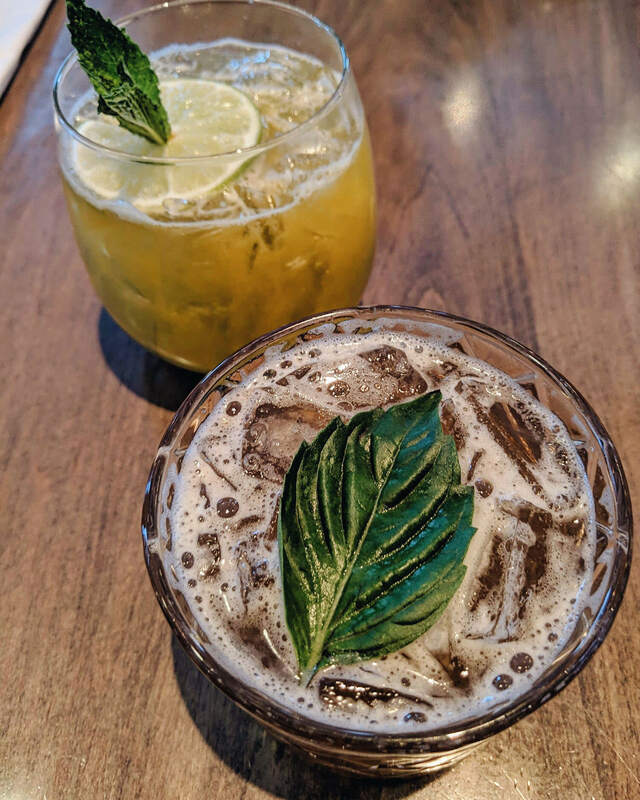 Refreshing Thai Basil Bourbon and Passionfruit Mojito from Crazyweed Kitchen. The restaurant that completely wow-ed our group is Crazyweed Kitchen. It’s definitely a fancier restaurant, named perhaps after the plants (weeds?) and vegetables on its rooftop garden. Crazyweed serves up some amazingly tasty and tender (at least for the meats we tried) food. When I posted about Crazyweed on my social media, I got over a dozen messages from people who said Crazyweed was their favourite restaurant in Canmore! I can totally see why. It is a bit pricier but it makes for quite a lovely night (or lunch) out, and the drinks there are phenomenal! For drinks we would recommend the Passionfruit Mojito, Thai Basil Bourbon, and Caravel Captain’s Log German Pilsner. For dinner we would recommend the Yam Frites, Tomatillo Chipotle Cream Fettuccine with Shrimp and Chorizo, Double Pan Seared Pork Chop with Potato Cake, Tofu, Chickpea and vegetable Buddha Bowl (vegetarian), and the AAA Striploin with Cumin Roasted Cauliflower. Reservations are highly recommended. My friend who lives in the area also says you get a discount at lunch if you bike up, lol. Where the Buffalo Roam Saloon is located on the main street downtown and is packed on weekends! We also had some great drinks at the Where The Buffalo Roam Saloon. It’s a small place and on a Saturday night was fully packed. We waited about 45 minutes to get a table (worth it!) This was our after-dinner spot, so we weren’t really here for food (though I’d like to try their brunch menu in particular). For drinks, we would recommend the Pisco Punch (pineapple rum, pine apple shrub, egg white, honey vanilla syrup and lemon juice), Grapefruit Moon (vodka and a ginger liqueur with grapefruit juice and lemon juice), Under the Greenwood (gin, aperol, honey sage juniper syrup and lemon juice), Bourbon Smash (bourbon, cointreau, brandy, cranberry jelly and orange juice) and the Where the Buffalo Roam Sour (bourbon, fresh lemon juice, honey sage juniper syrup and egg white). Not too keen on alcoholic drinks? They’ve also got a selection of mocktails too, which is nice! 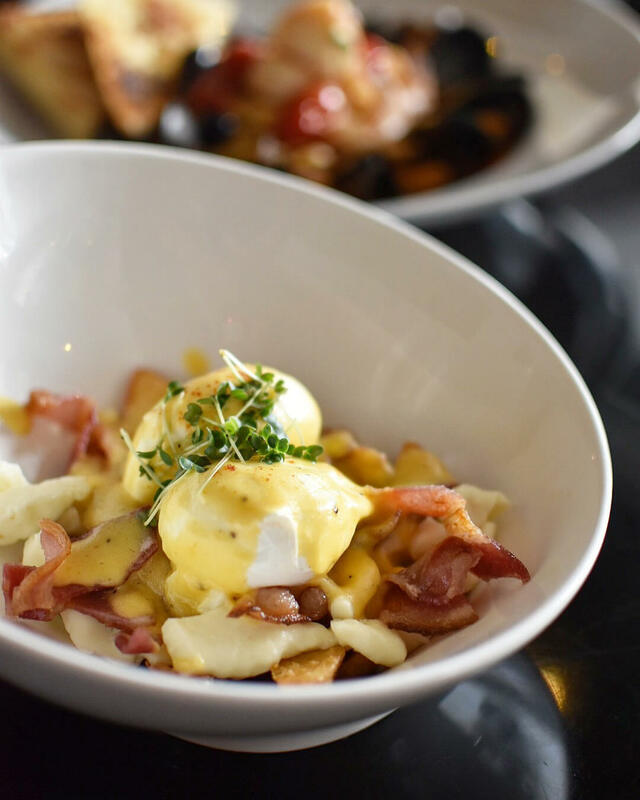 The Wakey Bakey Bowl at Grande Kitchen + Bar comes with a delicious brown butter hollandaise. 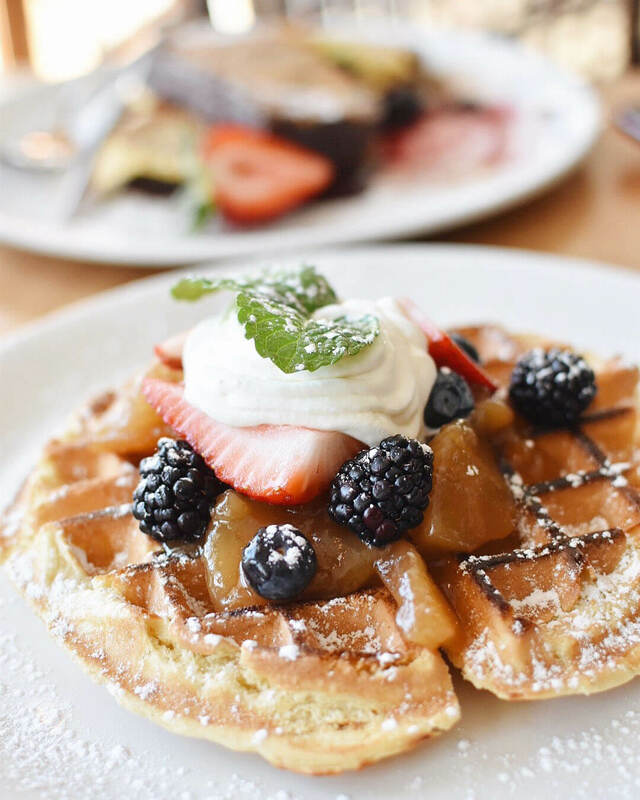 Of the Rocky Mountain Outlook restaurants I visited in Canmore, I loved the fluffy house made waffles with maple stewed apples, chantilly and fresh berries at Table Food + Drink. The Chef’s Signature Seafood Pescatore pasta at the Grande Kitchen + Bar is great (and a huge portion) and any of their dishes with house made brown butter hollandaise should be ordered. The Solario vegetarian penne pasta with sundried tomatoes, onions, mushrooms, spinach, peppers, artichokes, feta, and olives in an olive oil, white wine and herb sauce at Patrino’s was really good. I’d also go back there for the AAA prime rib. Graze Food & Drink (website and social media hasn’t been updated in awhile) is also a nice spot, with a really delicious Roasted Yam and Avocado Salad (add salmon!) Graze also has a bunch of vegetarian options. And the French-inspired Market Bistro just outside of town is truly lovely. I’d go home with a pile of their house made pickled items and they’ve got a great $25 three-course menu du jour on Mondays and Wednesdays. I honestly haven’t even scratched the surface when it comes to restaurant options in Canmore so certainly stay tuned for more Canmore food-focused blog posts down the road. Canmore is where I experienced ice climbing for the first time! It was an amazing (and challenging) experience. 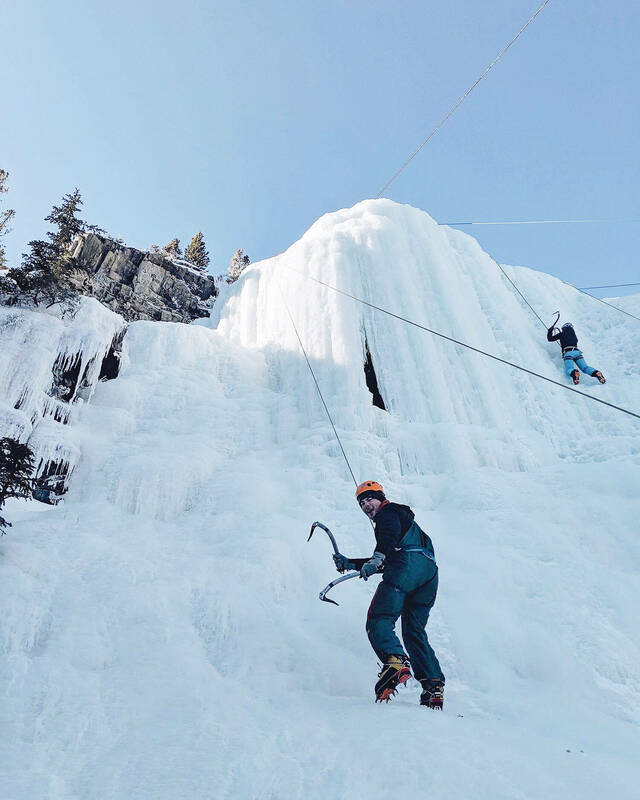 In addition to hiking, one of my most memorable outdoor Canmore experiences has to be ice climbing the frozen waterfall at Grassi Falls (also known as The Junkyards) in Canmore. 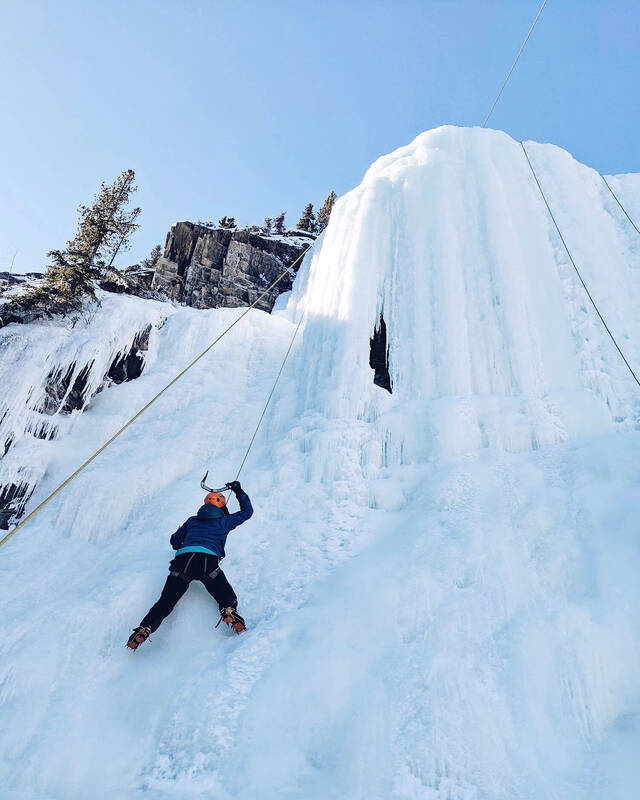 It’s highly recommended to do this type of outdoor adventure activity with an experienced guide or ice climbing enthusiasts, get advice and rentals from somewhere like Mountain Equipment Co., and dress very warmly! My adventure buddy for life, Mike! At the Grassi frozen waterfall, we were basically standing mid-way up the falls before you even get to ice climbing. It was really fun (very challenging for newbies like Mike and I though) and we’re grateful to our friends James and Ashleigh for taking us out and being patient with us as we attempted our first climb. Another fun outdoor activity you can try in Canmore is cross country skiing! It’s actually free at the Canmore Nordic Centre after 5 p.m. any day. The centre has a lighted loop that stays lit until 9 p.m.
And literally, so many more outdoor activities—from dogsledding to to sightseeing, fishing to canoeing, caving to camping. So as you can see, Canmore, Alberta is a wonderful little town located just outside Banff National Park. It’s a great place to visit on its own, or a great place to stay, dine and adventure at in addition to your Banff or Lake Louise adventures. Hotel and gas is cheaper in Canmore than in Banff or Lake Louise, which is a perk for sure. And you don’t have to pay a park fee to hang out in Canmore! 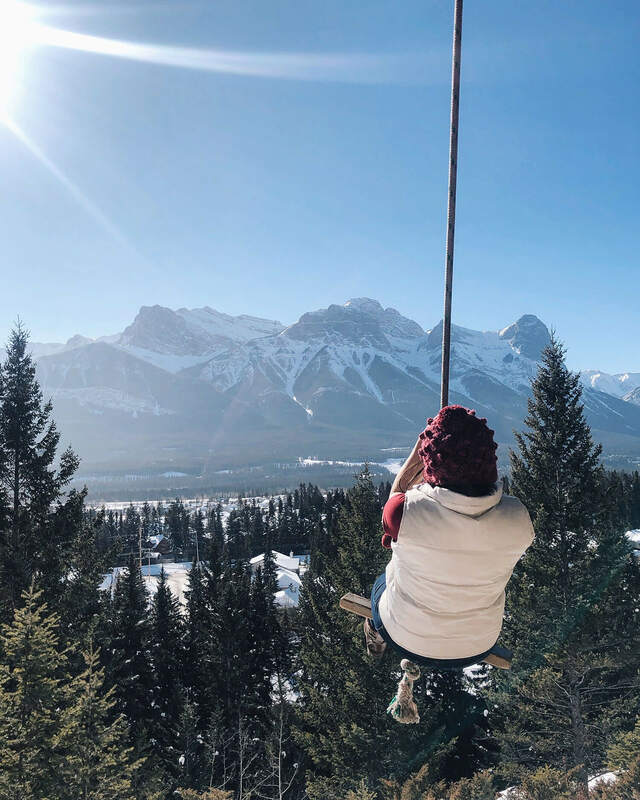 The Canmore Swing is a lovely landmark but there’s lots of other things to do and experience in the area too. While I’ve visited a few times now this year, there’s so many more things I’d like to do in the area! Visit Canmore Kananaskis Tourism for more tips and information to help plan your trip.